With Winter 2009-10 fast approaching we thought it might be fun to check out some of the ski deals that Resorts of Ontario will be offering this year. The resorts included in this post either have their own ski hills or they are offering a ski deal with lift tickets included. However, there are plenty more out there with great winter deals that are close to Ontario's downhill ski centres. For a complete list of these, check here. Blue Mountain, Ontario's best known ski destination, gets a lot of newbies wanting to try skiing or snowboarding so it developed a Discover Ski & Snowboard program. Since the program began, hundreds of couples, groups of friends and families have learned to ski and snowboard at the resort. This year, Blue Mountain Inn has a new Stay & Learn to Ski package to go along with its Discover Ski & Snowboard Program. The package includes one night of accommodation, a beginner lift ticket, equipment rental and lesson, a breakfast and a Pottery Restaurant dinner and is priced per person, double occupancy. Village Suites has a similar package with breakfast as a buy in option. If you decide to book either deal, drop by Jozo's in Blue Mountain Inn for some great apres ski. When we visited Blue Mountain earlier this year, we heard it's where all the locals hang out after a day on the hill. 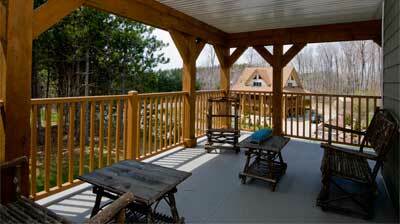 Similar getaways are offered at other Blue Mountain accommodations. For the best rates, reserve online or call one of the resort's leisure and travel representatives at 705-445-0231 or 877-445-0231. [caption id="attachment_416" align="aligncenter" caption="The new WaterSpa at Sir Sam’s Inn"] [/caption] Looking to combine romance and skiing? Sir Sam's is the perfect find. This romantic Haliburton-area inn not only has its own ski hill, its WaterSpa is spectacular and the inn's dining and wine list are both superb. Its ski hill has lots of gentle runs and a welcoming atmosphere for newbie skiers. This winter, Sir Sam's has a two-night "Learn to Ski" package that includes accommodation, dinner and breakfast each day, plus a day on the hills with full equipment, lift ticket and lesson. Save $55 and go mid week when this getaway is priced from $670 per couple. Eastern Ontario's Calabogie Peaks and Dickson Manor have developed a fun package for couples looking for a brief escape from the holiday crazies. Running from December 20-23, the package includes an overnight in one of the manor's deluxe rooms, dinner for two in its Canthooks Fine Dining Restaurant, 20% off of ski or snowboard lift tickets and complimentary ice skating, snowshoeing and cross country skiing. It's priced at $199 per couple. Dickson Manor also has an outdoor hot tub, indoor pool and fitness centre. [caption id="attachment_415" align="aligncenter" caption="One of the rooms at Hidden Valley Resort"] [/caption] Hidden Valley Resort is just outside of Huntsville, Ontario. Considered to be a good value ski hill with no line ups, Hidden Valley has its own luxurious hillside resort and restaurant. 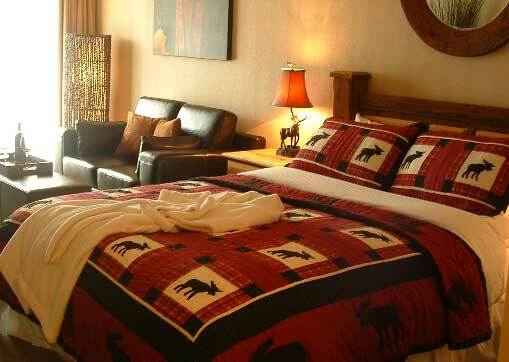 Ski & Stay packages here start as low as $85 per person, per night, double occupancy. Learn to Ski/Skateboard are two night packages starting at $215 per night, double occupancy. A variety of ski lift tickets are also offered to guests at a discounted rate. 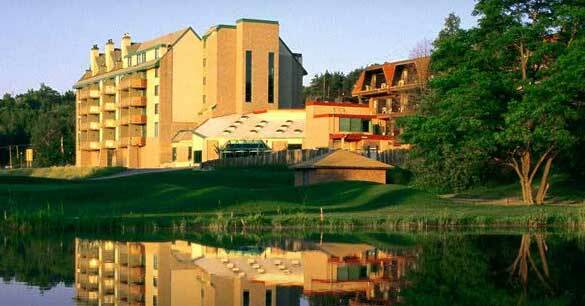 Horseshoe Resort is just over an hour north of Toronto near Barrie, Ontario. It has a Ski & Stay package this season that combines unlimited skiing or snowboarding for two with one night of accommodation and breakfast, based on double occupancy. All rooms have wireless hi-speed internet, movies and video games. And here's something worth noting, this hotel is pet friendly and has an 8000 square foot dog park. Priced from $2o3 per night, double occupancy, the package runs November 27-28, December 4-5, 2009 and then from December 11, 2009 - March 21, 2010 [caption id="attachment_417" align="aligncenter" caption="View from the deck of The Chalet at Horseshoe Resort"] [/caption] Close to Horseshoe Resort, you'll find Carriage Ridge. This family-oriented resort has partnered with two area ski hills this winter; Horseshoe Resort and Mount St. Louis Moonstone. Its open-concept condo suites are suitable for couples, small families or groups of friends. The suites include kitchen facilities, a king side bed, queen sofa-sleeper, balcony and living area. One or two bedroom suites with full kitchens, fireplaces and jacuzzi tubs are available for larger groups. There's also an indoor pool, kids pool, hot tub and games room. A "Ski-Xtreme getaway" is one of several offered this winter. It includes a one night stay in one of the oversized condo suites, a lift pass for Mount St. Louis Moonstone or Horseshoe Resort, lunch voucher and skiers welcome gift. Packages start at $89 per person, double occupancy and kids stay free. [caption id="attachment_418" align="aligncenter" caption="The main buildings at Hockley Valley Resort"] [/caption] Hockley Valley Resort is another ski resort close to Toronto. We wrote a bit about it in last week's post. It has a bunch of great ski packages listed on its web site starting at $229 double occupancy but we liked its Winter Bliss package. It includes one night's accommodation, lift ticket for skiing or snowboarding, full buffet hot and cold breakfast, three-course dinner for two and a $75 spa credit per person for Hockley's hillside spa. Priced from $463, double occupancy. For more resort packages, sign up for the Resorts of Ontario newsletter.